The Tunnel Bot is a portable, low-cost remotely operated terrestrial vehicle, designed for exploring compact spaces. It is designed to aid biologists and explorers in exploring and studying compact subterranean caverns, tunnels, or other caves where human-based exploration is impossible or difficult due to the physical size of the environment. Applications include exploration of habitats such as rabbit warrens, tortoise tunnels, and other small burrows. Tunnel Bot setup showing vehicle, joystick, and viewing screen. 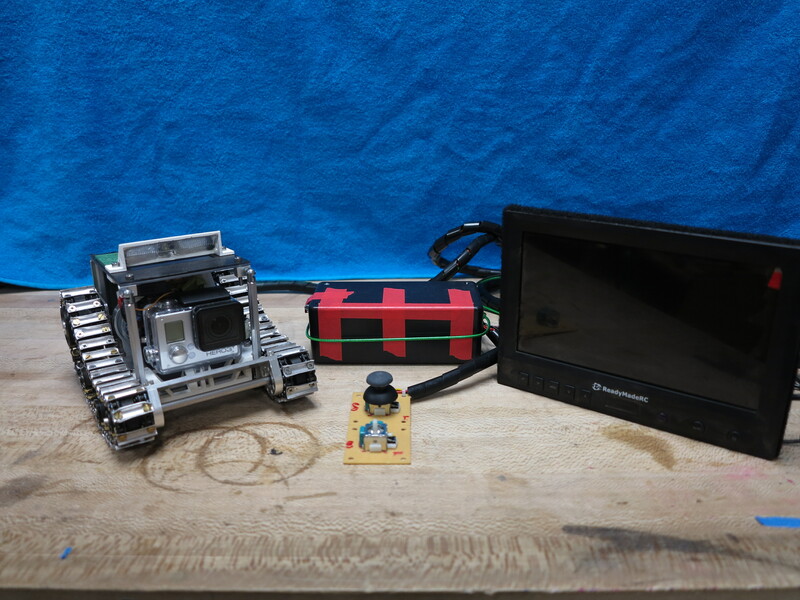 This vehicle incorporates a GoPro camera to permit first person view control of the rover, which allows the user to explore from the perspective of the burrow’s inhabitants. Â An attached LED light permits exploration of dark tunnels, and a tracked chassis allows the vehicle to tackle difficult terrain. Control of the vehicle comes from an intuitive arcade-style joystick setup, allowing operation of the system with minimal training.